I may have to change my profession. I came to that realization after finding this fine poster at Despair Inc. If you give bad advice to a business they go broke, and you have to start over. If you give bad advice to a politician they just raise taxes and excuses and keep going. You can probably make a good living just telling the DMV to change the color of its buildings every couple of years. National health care will be like combining the cost efficiency of the post office with the organizational efficiency of the DMV. Of course it will be administered with the love and affection of the Marines and the assured selflessness of congress. 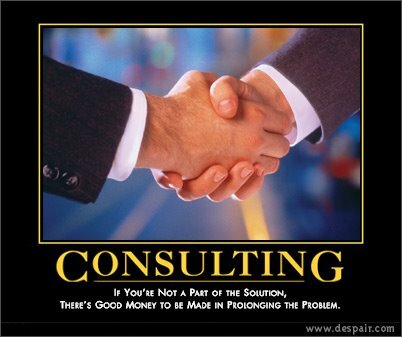 That will be a life long consulting post.